Is Bournemouth v Brighton on TV, what's the FA Cup team news, what are the odds? 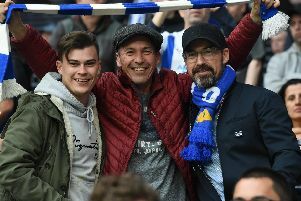 Brighton & Hove Albion travel to Bournemouth for the second time in just two weeks on Saturday when the sides meet in the third round of the FA Cup. What time does Bournemouth v Brighton kick off? The match will get underway from the Vitality Stadium at 12.30pm. It is the second meeting between the sides in just two weeks, after Bournemouth ran out 2-0 winners in the Premier League in December. Not in England. The match has been moved to a 12.30pm to be broadcast live on beIN Sports in France. Several other foreign TV channels will also be broadcasting the game. Highlights of the third round matches will be on Match of the Day on BBC One from 10.20pm on Saturday. Both sides will likely make several changes after a hectic spell in the Premier League of four games in just 11 days. Artur Boruc could replace number one Asmir Begovic in goal for the Cherries, while Lys Mousset, Jordon Ibe, Jermain Defoe, Diego Rico and Tyrone Mings will all be eyeing starts. Young defender Jack Simpson could also come into the starting line-up. Jason Steele will make his debut in goal for Brighton, after joining from Sunderland in the summer. Number one Mathew Ryan is at the Asian Cup with Australia, while David Button has played the last two Premier League matches. Bruno and Gaetan Bong could come in at full-back, with Leon Balogun partnering Dan Burn, who could also make his debut, in central defence. Beram Kayal and Yves Bissouma will likely come into the side in central midfield, with Anthony Knockaert and Viktor Gyokeres pushing to be named in the starting 11. Florin Andone is likely to start up front. Michael Oliver will be the man in the middle, with Adam Nunn and Ian Hussin his assistants. Craig Hicks is the fourth official. VAR will be used for the game, with Craig Pawson the video assistant referee and Sian Massey-Ellis the assistant video assistant referee. Bournemouth are the favourites to reach the fourth draw at 10/11 on PaddyPower. Brighton are 3/1 to win, with the draw 23/10. A repeat of the Cherries' 2-0 win last month is 15/2, while Brighton are 19/1 to win by the same scoreline. Bournemouth striker Callum Wilson is 4/1 to score first and 7/5 to net anytime. Joshua King is 5-1 to open the scoring and 7/4 to score in the 90 minutes, with Jermain Defoe 5/1 and 8/5 respectively. Brighton forward Florin Andone is 7/1 to score first and 23/10 to strike at any time. Jurgen Locadia is 10/1 and 7/2 respectively, while Yves Bissouma is 30/1 to score the first goal and 11/1 to net anytime.